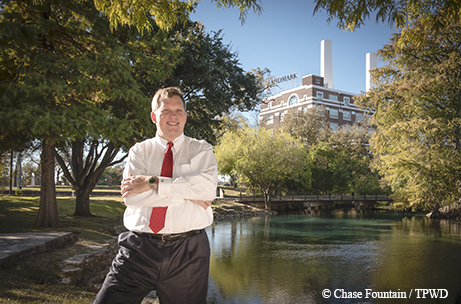 Top city official takes us to his family’s favorite New Braunfels destinations. New Braunfels Mayor Barron Casteel meets me at the Landa Park Golf Course clubhouse on a sunny day. A partner at the law practice of Casteel & Casteel, he belongs to the New Braunfels Chamber of Commerce Blue Coats and the Elks Lodge and serves on the Wurstfest board. Casteel, wife Michele and their sons James Carter, 12, and Hudson, 7, play sports, camp, hunt, fish, float the river, ride bikes and otherwise take full advantage of outdoor life in this pleasant burg. I came for a visit so Casteel could show me how that’s done, New Braunfels style. Like mine, many visits to New Braunfels start at Landa Park, which turned 80 last year. The math takes you back to 1936 and the Great Depression, Casteel points out, yet despite those hard times the community passed a bond election to buy the parkland, which had been purchased in 1860 by merchant Joseph Landa. Their investment looks very wise today; these 128 acres take in Comal Springs — seven large and dozens of smaller springs that together form the Comal River, one of the country’s shortest rivers at about 2 miles — as well as a swimming pool filled by the springs, picnic facilities, giant oak trees, trails, a miniature train, paddleboats, an arboretum and the aforementioned golf course. Landa Park may be best known, however, for “toobing” — floating downstream on an inflatable tube. Landa Falls, an outfitter in the park, claims to offer the longest float on the Comal, the Casteel family’s favorite. It takes a couple of hours to float to the Riverbahn exit, in the Schlitterbahn complex, where air-conditioned shuttle buses pick up toobers to return them to Landa Falls. As a kid, Casteel floated mostly on the Guadalupe — whose cold waters, he recalls, “lift you right out of your tube” — to his family’s home near Lake Dunlap, south of Interstate 35. The mayor also grew up spending time at his grandparents’ place along the Guadalupe below Canyon Lake, created in the 1960s to control flooding. In 2002, he drove a four-wheel-drive Suburban across what was nothing more than a small creek at the time but became a raging torrent a few weeks later. An estimated 34 inches of rain in one week sent water over the Canyon Lake spillway for the first time, peaking at a rate of roughly 67,000 cubic feet per second — far exceeding the river’s typical 350 cubic feet per second. The water flowed for six weeks, carrying away enough debris to cover a football field 30 feet high and creating a gorge 45 feet deep and more than a mile long out of 109-million-year-old Glen Rose limestone. Casteel recalls walking in it once the waters receded, amazed at the transformation. The Gorge Preservation Society formed and began offering guided tours, showing people tracks of an Acrocanthosaurus (an early Cretaceous-era predator dinosaur), springs, waterfalls and pools occupied by fish and tadpoles. The Gorge also revealed an unmistakable crack in the earth, the actual Balcones Fault. Geodes sparkle in the rock among fossils from distant eras: bivalves, gastropod snails, worm tubes, sea urchins and foraminifera (small, single-celled organisms that still occupy our planet). Two nearby spots and favorites with the Casteel family, Natural Bridge Caverns and Natural Bridge Wildlife Ranch, belong to longtime locals. Self-driving tours through the 400-acre wildlife ranch include bags of feed, guaranteeing up-close encounters with native and exotic residents such as gemsbok antelope, elk, wildebeest and zebra. 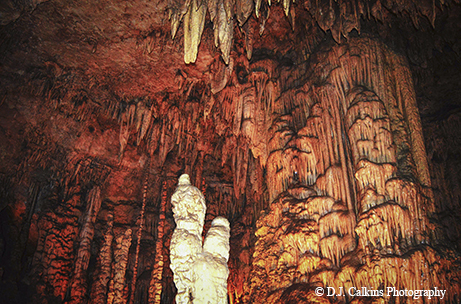 Cave formations dazzle visitors at Natural Bridge Caverns. An annual tradition for the mayor’s family is Christmas at the Caverns, which includes a Christmas village, a maze and hayrides on the grounds and caroling inside the caverns. Year-round guided tours wind about three-quarters of a mile and 180 feet deep, through several large chambers and impressive formations. No one even knew the caverns existed until college spelunkers discovered them in 1960. Near the caverns, Bracken Cave boasts the world’s largest concentration of mammals — female Mexican free-tailed bats that arrive in March to raise their babies. They emerge every night to feed on insects throughout the summer. “They’re great pest control. Without them, being outside would not be as pleasant,” Casteel points out. Bat Conservation International now owns the cave and 660-plus acres of land surrounding it, offering tours to watch the nightly emergence. Bats fly out of the sinkhole in ever-increasing numbers, eventually forming a swirling tornado of blurred gray forms. The vortex splits into streams stretching like plumes of smoke into the darkening sky. “The tour is very impressive,” Casteel says. “They do a great job of educating the community about the significance of the bats.” In addition to their role as natural pest control, bats play vital roles in agriculture, plant pollination and seed spreading, but they face serious threats, including loss of caves that don’t enjoy protection like this one. The old post office now houses McAdoo's Seafood Company, serving Creole and Cajun specialties. New Braunfels residents enjoy these far-flung adventures, but also love their historic downtown. 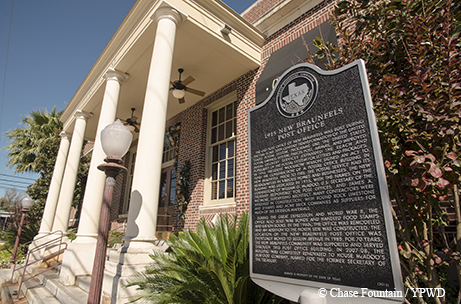 A walking tour smartphone app delivers location-specific information about historic landmarks such as the oldest German bakery in Texas, homes from the 1800s and an 1890 railroad depot, as well as a series of contemporary murals that celebrate the lives and culture of the area’s first settlers. One of those buildings, the circa-1915 post office, now houses McAdoo’s Seafood Company. Its beautiful renovation preserves high ceilings, wood and marble. Casteel admits to using the promise of lunch here to lure his boys to Mass at the Catholic church less than two blocks away. The menu of Texas Creole favorites and authentic Cajun specialties — etouffée, gumbo, shrimp and cheese grits, Cajun enchiladas and fresh fish — makes for a powerful bribe, as does the New Orleans-style courtyard. Mayors (and even dads) need a break now and then, and Casteel likes to go to Phoenix Saloon for his. This casual chili parlor in the 1871 Gebhardt Chili Powder building downtown was reportedly the first bar in Texas to serve women. Today, everyone enjoys live music, a wide selection of beers on tap and chili made with hunks of sirloin and, of course, no beans. Casteel calls this the best chili there is, but warns that it carries a kick. At the nearby New Braunfels Farmer’s Market, held on Saturdays year-round, Casteel says you can get just about anything you want. More than 60 local farmers, ranchers, restaurants and artists pack the covered stalls with baked goods, meat, produce, cheese and more — plus there’s live music. This town’s first residents arrived with Prince Carl of Solms-Braunfels, Germany, in 1845. Downtown’s streets retain the original layout, and a distinctly European main plaza continues to serve as the center of celebrations. It sports a fountain cast in 1896 by J.L. Mott Iron Works of New York, with a curb added to keep folks from watering their horses in it. In the 1990s, Casteel reports, a driver lost control of his car and crashed into the fountain. Robinson Iron of Alexander City, Alabama, restored the landmark, and the community celebrated with a big “Welcome Home” party in November 2004. Drought forced city officials to turn off the water in 2012, but they happily turned it back on in June 2015. The local Parks Foundation receives coins tossed into the water. 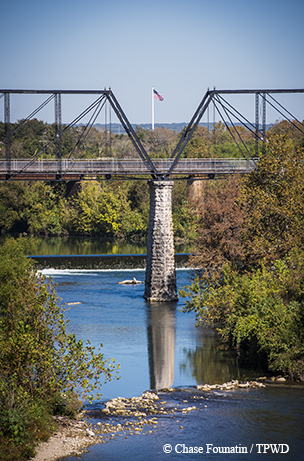 The 1887 Faust Street Bridge, closed to cars, offers up-close views of the Guadalupe River and serves as a city park. Our last stop is the 1887 Faust Street Bridge over the Guadalupe near where the Camino Real once crossed, the only multiple-span Whipple truss bridge still surviving at its original site in Texas. We walk on large, rough-hewn timbers beneath impressive iron Whipple trusses, where a row of benches offers spots to rest and soak up beautiful views of the river flowing below. The bridge closed to traffic in 1978, and the city took ownership in 1998, the mayor explains, over the objections of some who thought it would prove a liability. Now a city park, it can be rented for events or just enjoyed as a pleasant place to walk or ride bicycles, which the mayor has done with his boys. “A beautiful part of being a resident of New Braunfels is not only enjoying it all, but seeing all the other people who come to enjoy it, too,” Casteel says as he heads back to his day job. If you needed an invitation to visit, now you have one from the mayor.